Photograph of Joshua Thompson that serves as the frontispiece (opposite the title page). 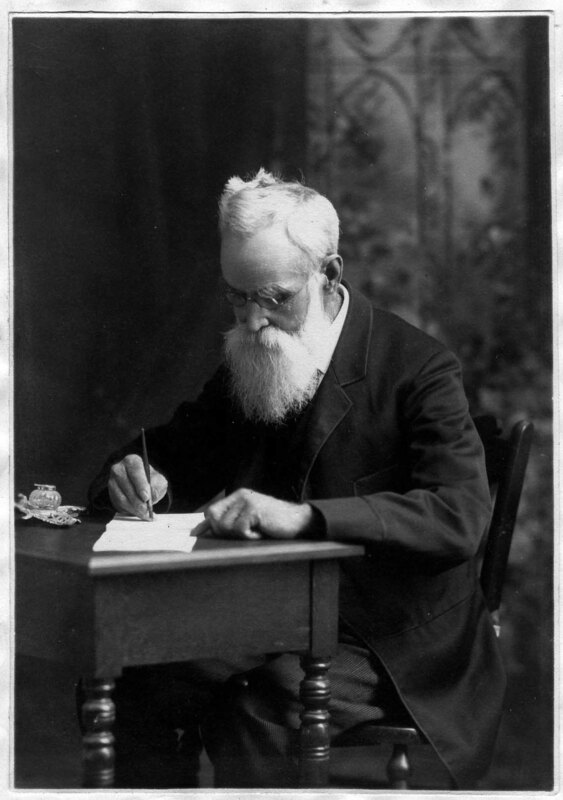 Over a century has passed since Joshua Thompson placed his pen to page to compose A Family History and Biographical Sketch of My Father’s Family. He initiated his labours in May of 1905; the cover page records that he presented the 300-page manuscript book to his son, Dr. Charles Walden Thompson, at a family reunion in Clinton, Ontario on January 1st, 1907. The opening lines of his book suggest that he had been working on “short biographies” of his immediate family since the late 1890s. However, Joshua notes that he intended to supply an identical hand written copy to each of his surviving children; aside from two other copies (for his son Allen and daughter Gertrude), it is not known how many of these other versions survived the subsequent century. This one passed through inheritance from Charles Walden to his son, Dr. Fred Greene Thompson, and from him to his son, Charles Wilson Thompson. Joshua commences work on the Family History at 82 years of age. His own mortality is very much on his mind, prompting, if not exactly a sense of urgency, then at least a notion of timely responsibility. “The future is all hid from me,” he writes, with no inkling that he will endure for more than another decade, during which time he will tip-in additional pages to the original book and append marginal notations. In the grand tradition of classic literature, he makes a brief apology for the fault of his memory regarding events recalled from the dim recesses of the past and then launches into his work. One can only admire his command of his faculties, his dedication, his elegant penmanship, the sweeping biblical style of his writing, and his concentration. The family Joshua documents lived in a turbulent century, but the book contains little historical context, outside of a brief reference to his uncles having died in service during the War of 1812, a sidelong reference to Fenian Raids and other snippets. His literary lens is focused sharply on family. This entry was posted on October 4, 2013 at 3:42 pm and is filed under Book Design, Books, Genealogy, Writing. You can subscribe via RSS 2.0 feed to this post's comments. You can comment below, or link to this permanent URL from your own site. Allen’s copy was shown on occasion at family gatherings in the late 1970s…1980 or so. Allen’s two sons, Trevor (1898-1982) and Meredith seemed to have possession. I assume it would be with Trevor, as Meredith didn’t have kids. ( ……but he was certainly a font of knowledge when it came to family history and Chaucer; he could surely play the piano; and he spoke of CS Lewis and JRR Tolkien as if he’d known them… which I thought was quite brilliant!) . Thank you Susan. I have updated the blog and the electronic files of the book with the information you have sent. Great to know there are still copies floating around out there. Thank you Larry. I am so excited about your project and hope you do not mind if I continue adding my well-meaning comments. Re: Speak of Turbulent times…. I first became aware that the Donnelly massacre occurred in Feb 1880 on the Donnelly concession on Roman Line on the Granton side of Lucan. work or works by Lewis and Tolkien. Meredith Thompson Appointed New English Professor Dr. Meredith Thompson has been appointed associate professor in the department of English. The former head of the department of English at United College, Winnipeg, Dr . Thompson has been teaching at the University of Southern California since 1947. He obtained his bachelor of arts and master of arts degrees at the University of Toronto . He has done post-graduate work at McMaster University and Oxford and was awarded his doctor of philosophy degree by the University of Breslau. Before joining the staff of the University of Southern California, Dr. Thompson taught at Wesleyan College, Middleton, Connecticut. Dr. Thompson’s special interest is English philology and old and middle English . He has edited Middle English works for the English Text Society. Susan, you’re comments are most welcome! It’s quite amazing what was happening in Ontario during the period that Joshua writes. And yet, he is focused sharply upon family history as opposed to any other.